Standing on the most southwesterly point of the Palos Verdes Peninsula, Point Vicente Lighthouse has long been one of this area's jewels. To the landsman, the lighthouse is scenic delight and continual attraction to sightseers, tourists, photographers and painters. To the mariner, the lighthouse is an aid to navigation which marks the northern end of the Catalina Channel on the Pacific coast. It helps him plot his position and warns him to avoid the rocky schoals which surround the nearby shore and, in a heavy fog, its horn will warn him if he gets too close to the dangerous shore. The point was originally named in 1790 by Captain George Vancouver. Vancouver explored the Pacific coast for England in his 90 foot sloop Discovery. He named the point for his good friend Friar Vicente of the Mission Buenaventura. He also named Point Fermin in a similar manner. Before the installation of lighthouses on the Pacific coast, many ships and seamen went to their graves on its rocky schoals. Shipmasters deplored this dangerous stretch of coastal water. On May 1,1926 their petitions were answered when the U.S. Lighthouse Service began the operation of the brightest beacon in Southern California, Point Vicente Lighthouse. The 1000 watt bulb, focused through a five foot lens, could be seen over twenty miles. The lens, hand ground by Paris craftsmen in 1886, saw forty years of service in Alaska before its installation here. The tower itself is 67 feet tall but the main beam of light marks Point Vicente from a height of 185 feet above the ocean. Built on plastered reinforced concrete, it is very similar to one on Anacapa island in the Channel Islands chain. Operation of the lighthouse was transferred to the U.S. Coast Guard in 1939. The Lighthouse was manned until automated equipment and remote control operators took over in 1971. In 1934 the radio station and the radio navigation beacon were added. For many years, Coast Guard radiomen at Point Vicente monitored the international distress frequencies, ready to help any vessel in need. The last radioman locked the doors in 1980 when the task was transferred to another station. The radio station buildings of that station are still here although the old equipment is now long outdated. During World War Two, the peninsula was defended by many heavy gun inplacements of Fort MacArthur. During that period, the 1000 watt light was replaced by a tiny 25 watt bulb, and black out curtains hung ready for use in all the windows. The Coast Artillerymen didn't want the light to be too good of an aid to enemy navigation. After the war, the endlessly rotating beam became a glaring disturbance to local residents and a positive hazard to motorists on Palos Verdes Drive. Keepers coated the inside of the inland facing windows with a coat of white paint to end the flash of the beacon on peninsula bedroom walls. That is when the "Lady Of The Light" appeared. In the dim light through the painted windows, some saw the shape of a tall serene woman in a flowing gown who would slowly pace the tower's walkway. Some said she was the ghost of the first lighthouse keeper's wife who stumbled from the edge of a cliff one foggy night. Others say she waits for the return of a lover lost at sea, while still others think she is the shade of a heartbroken woman who threw herself from the cliffs when she found herself abandoned by her intended. Today Point Vicence Light still sends out it's beacon across the Catalina Channel. Electronic sensors and automated controls have replaced the lighthouse keeper and activate the fog horn. Far from abandoned, the housing facility is home to regular Coast Guard personnel assigned to nearby ships, stations and offices. The former radio center is now manned by volunteer civilian members of the Coast Guard Auxiliary who are responsible for the lighthouse in addition to tracking distress calls from boaters in the Catalina Channel. The radio center also tracks Auxiliary aircraft patrolling offshore waters on weekends. On November 17, 1979, Point Vicente Lighthouse was added to the National Registry of Historic Sites. The Coast Guard Auxiliary is an arm of the Coast Guard, composed of local civilian citizens from all walks of life. The Auxiliary performs search and rescue duty in local waters, teaches free boating safety classes, performs safety checks on pleasure boats, flies aircraft patrols and maintains a radio communications network in Southern California. 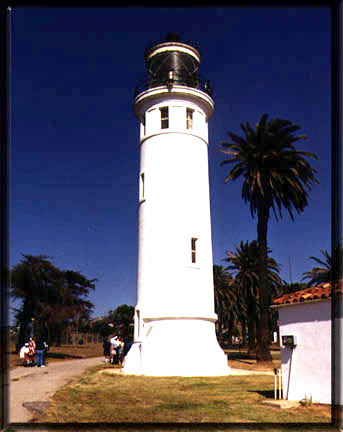 The Point Vicente Lighthouse is located at 31550 Palos Verdes Drive, West in Rancho Palos Verdes, California, about a quarter mile south of the southern end of Hawthorne Blvd. [MAP] The grounds and lighthouse are normally closed to the public. However, the tower and a small museum are open to the public from 10:00 A.M. to 3:00 P.M. the second Saturday of each month with the exception of March when the tower and museum are open the furst Saturday of the month from 10:00 A.M. to 4:00 P.M. to coincide with the City's Whale of a Day event. Children under 7 are not allowed in the tower and pets are not allowed on the Coast Guard grounds. Weddings and receptions are also not permitted at the Point Vicente Lighthouse or grounds. For recorded information, please call (310) 541-0334. This web site was created and posted on the Internet by Palos Verdes on the Net as service to the community at no expense to taxpayers. For more information about the U.S. Coast Guard Auxiliary, click here. For more information about the U.S. Coast Guard, Pacific Area, click here. For more information about the U.S. Coast Guard, click here.